Deadpool does on this what he loves to do: jumping on his enemies. Ready to take off his blade ad slide them into pieces, Deadpool might just wink to the spectators when he's done. And of cource, the background of this t-shirt is red. 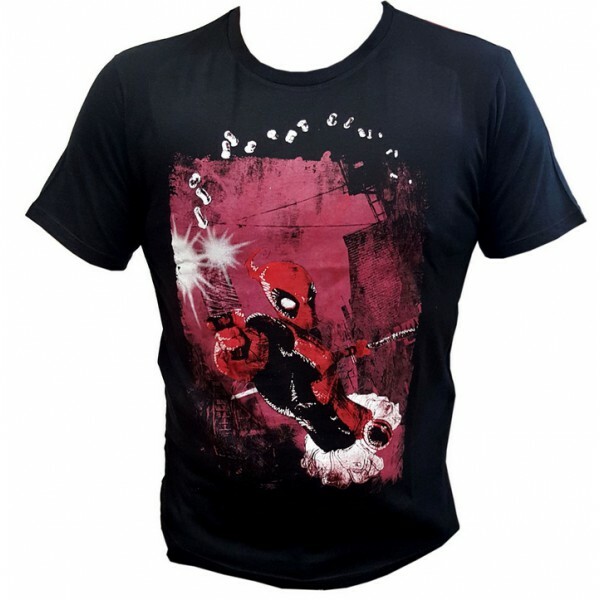 This Deadpool Jump t-shirt is 100% Coton. Si vous choisissez de recevoir votre "Deadpool T-Shirt Shotgun" via Lettre Suivi, les frais de ports seront seulement de 2,95 € ! Ce Deadpool T-Shirt Shotgun est en stock dans les tailles M/L/XL !